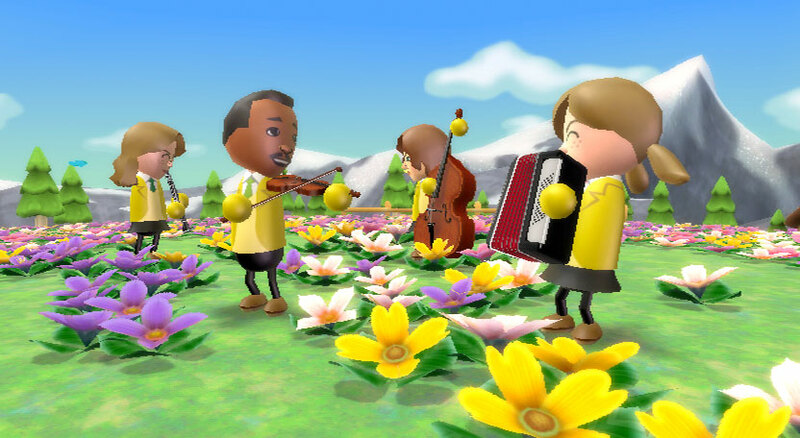 Wii Music is an interesting game from Nintendo that has had mixed reviews, however depending on the target audience of the title is either quite innovative or frustrating. 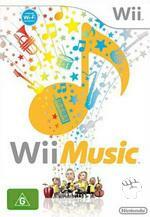 The premise behind Wii music is to use the innovative control system of the Nintendo Wii to play a variety of music as you jam with other players or compete in a variety of games as you make your own unique interpretations of the pre-existing music. The range of musical instruments that you play is quite diverse which range from instruments such as the piano, guitar, drums and even stranger ones such as the gong or my favourite, the saxophone. Play it again: Use the playback mode to see your jam recordings brought to life with dramatic camera angles. 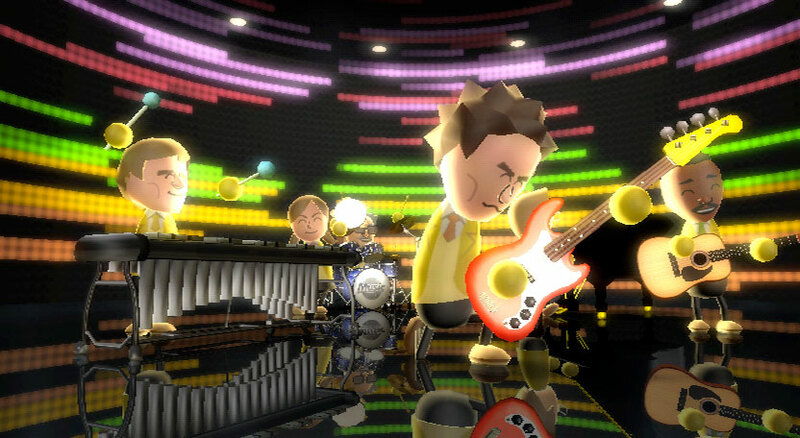 Pick up the baton: Command an orchestra in the conducting game where you’ll wave the Wii Remote controller like a conductor’s baton to lead a Mii orchestra through orchestrated music. Make them play quickly, slowly, strongly or gently. Ring a bell? Play a handbells game where you’ll swing your Wii Remote and Nunchuk controllers to play your two handbells as part of a larger ensemble. Everyone on the team has a job to do: Play one of your notes only when the tune demands it. An ear for music: Take a tone quiz that tests your musical ear by giving you challenges, like putting note-playing Miis in order from lowest to highest pitch. Bang the drum: Play a virtual drum set in the drumming mode, the one mode in Wii Music that also uses the Wii Balance Board accessory (sold with Wii Fit). You’ll use the Wii Remote and Nunchuk controllers as drumsticks, and place both feet on the Wii Balance Board—which work as virtual pedals for the bass drum and hi-hat cymbal. In order to begin Wii Music, you need to finish the tedious tutorial which teaches you the basics of the game that has a classic Nintendo-type character with their chipmunk voice. You play the instruments by holding them as you would a real-word instrument that uses the remote and the nunchuck. In order to play the piano you use mimic playing the piano by pushing down the remote and nunchuck like you are playing the piano. To play guitar, you hold the nunchuck as you would the instrument's neck and strum the air with the remote. Whereas with the drums, you raise the controllers up then bring them down to play the drums, however the faster you do it, the more sound you will make. As mentioned before my personal favourite is the saxophone which you put the Wii remote to your mouth and push the buttons to play the notes. In its essence, the game is basically a rhythm game which will display the notes on the screen in order for you to select the corresponding notes. Its simplicity is the magic which allows anyone to play the title, however for the more mature gamer, the title will become a tad repetitive, however for younger gamers, the gameplay could virtually become endless as they jam with either friends or the AI and make a variety of musical tunes which can be saved for music videos and even CD covers. The main problem with the music is that the game rewards you no matter how you play which means some of the music can sound extremely bad, however if you do follow the notes to be played, it's actually quite humbling in a MIDI music type way. By pushing different buttons as you mimic the real-world instruments, they will allow you to create your own interpretations that can be quite boppy or sound quite bad so it's a mixture of skill and practice. The title also contains a variety of genres from electronic, country and even jazz. Where the game does excel for the more mature gamer is playing cooperatively or competitively against friends. You can jam with up to four players, each playing a different instrument as you rock to a variety of classic songs. Games such as Maestro allows you to conduct an orchestra, whereas other games such as Hand Bell Harmony allows you to shake bells to the notes that appear on the screen which are in the shape of bells. Quite fun! Musically, the title is quite lacking for a music game as the tunes are all MIDI and sound like those old classic electronic pianos like the Casio. 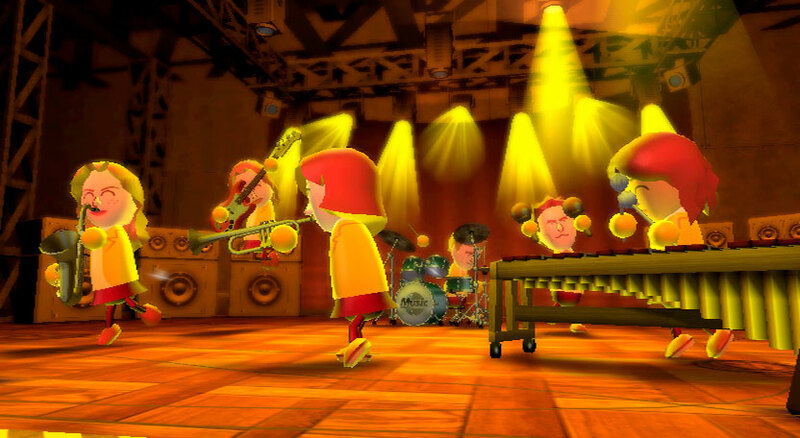 The tunes included in the game are also quite old that features music such as O'Christmas Tree, Twinkle, Twinkle Little Star and Daydream Believer. Where the game does excel is through Nintendo classic tracks such as Super Mario Bros, Animal Crossing and F-Zero. Unfortunately the title does not contain any modern tunes from bands of today which is a shame. At the end of the day Wii Music is an interesting title, however it fails to achieve the heights of games such as Rock Band 2 or Guitar Hero World 2, however for the younger gamers, the title does deliver in terms of replayability and some musical freedom. Just be warned though, parents may want to leave the room when their children start letting out their musical muse.